The World Cup of Hockey has been a showcase of skill, speed, and passion with plenty of story lines that have won our hearts. Before the tournament began, Team North America was attracting plenty of attention from fans looking forward to seeing how they would fare throughout the tournament against their older competitors. Needless to say, the “kids” really did live up to the hype. One kid in particular has yet to put on the Toronto Maple Leafs sweater, but has already captured the hearts of the Toronto fan base. 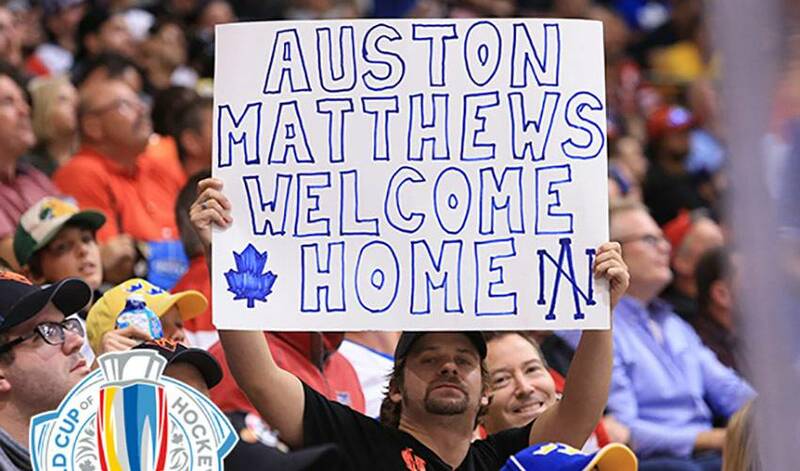 The Auston Matthews show arrived at the Air Canada Centre (ACC) on September 8th with Team North America’s debut, and it is certainly here to stay. Matthews successfully used his size, skill and hockey IQ to be an effective offensive force for Team North America. The team was unable to advance to the semi-finals of the World Cup of Hockey, to the disappointment of many hockey fans, because they were so fun to watch. However, this tournament was not only a chance for Matthews to get a taste of highly competitive hockey, but also a chance for Maple Leafs fans to see what kind of a special player their future has in store for them. With their international experience coming into play, some of the younger players across the tournament were able to excel at an elite level. Olli Maatta, who played for Team Finland in this tournament, commented on the likes of Matthews and his Team Finland teammate Patrick Laine. "Those guys are very mature, they look like they've been around for many years," Maatta said. These comments are coming from 22-year-old Maatta, who himself has already experienced international success winning an Olympic Bronze in 2014, and hoisted the Stanley Cup with the Pittsburgh Penguins last season. Matthews, who recently turned 19, has already seen international experience and career success by representing the United States in the National League A (Switzerland). Not a bad resume for someone who has yet to play in an official, regular season NHL game. What makes Matthews and his performance in the World Cup of Hockey so memorable is how confident and comfortable he seems to look on the ice at this level. At a media availability prior to the tournament kick-off, Matthews was asked, "When do you ever feel uncomfortable on the ice?" It is safe to say that Matthews is confident, dialed in, and ready to make his Toronto Maple Leafs debut this coming season, which is just around the corner. When Matthews found the score sheet for the first time against Russia, the ACC gave "loud" a brand new meaning. The level of excitement and passion surrounding the Maple Leafs’ first round draft pick has been a key story line throughout the World Cup of Hockey. After this showcase, there’s no doubt the hype will continue throughout the 2016-17 regular NHL season.